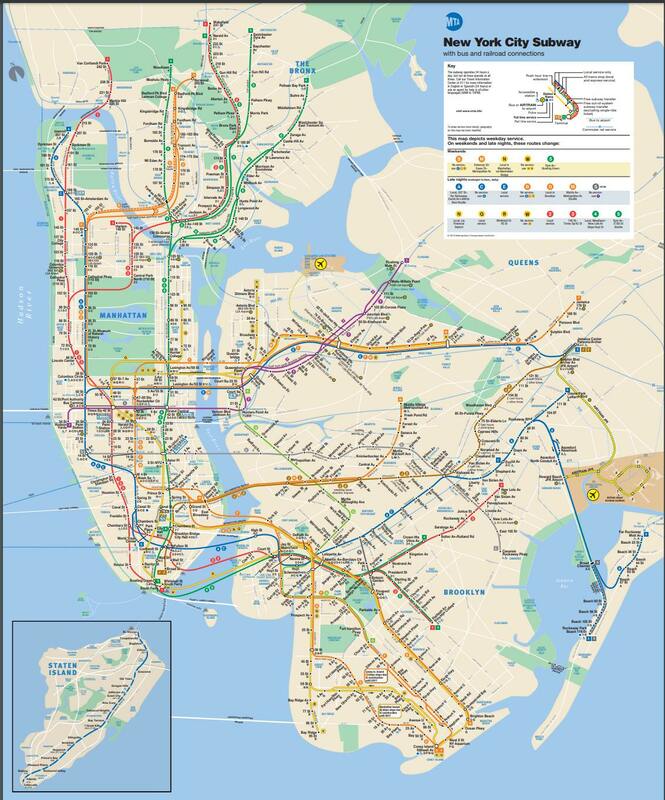 There are two methods of public transport available to get you from LaGuardia Airport in Queens to Midtown Manhattan, the city centre of New York. The easiest and most convenient option is to take a LaGuardia Airport taxi. The ride will take around 29 minutes. Taxis at LGA are metered and you can expect to pay around USD$40 (37€) to Manhattan, plus tolls. For a cheaper option, you can take the train which will cost USD$2.75 (2.40€) and take around 50 minutes. There is no direct metro route or AirTrain service at LaGuardia Airport. If you wish to use the subway system to reach Manhattan from the airport you will need to take the Q70 SBS La Guardia Link Airport Bus to transfer to the metro station, located nearby the airport on Roosevelt Ave. This transfer will take approximately 15 minutes. From Roosevelt Ave you are able to take the E Subway Line into Midtown, which will take around 35 minutes. How much is the train from LGA to city centre? The train and bus will cost USD$2.75 (2.40€) each for a one-way journey, however if you board one within two hours of buying the ticket you are able to transfer to a subway or another bus service for free if you use a Metrocard, keeping the price low. Metrocards can be purchased from stations at ticket machines or from Metrocard agents. Both the subway and the Q70 bus operate 24/7. 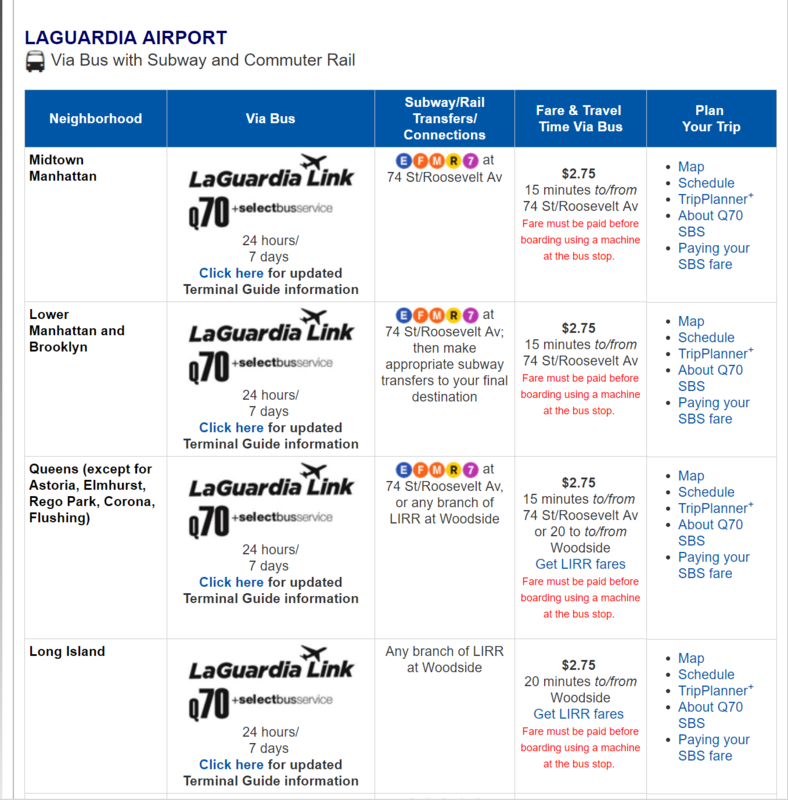 You will need to take the Q70 bus from terminals B, C or D at LGA Airport. The E Line Subway will leave from Roosevelt Avenue Station in Jackson Hights, so alight the Q70 here to take the next transport leg. Despite its low cost, there are extra transportation steps for taking the subway from LGA as there are no direct lines from the airport. Having said this, the services operate 24/7, therefore if time and luggage are not issues, it is a cheap and relatively easy way to get to Manhattan. It is better to purchase a Metrocard for USD$1, even if you don't plan on using the public transport much. It will not only save you money (even on one use) but will save you time on your commute. The only places in the station to get tickets or metrocards are from the ticket machines or from the licenced Metrocard agents. The subway runs much more frequently in peak hours (between 3-5 or 6-8 minutes). There are many connections from Roosevelt Ave Station, so you can choose which metro service best suits your needs. If you feel more relaxed knowing that somebody is waiting for you, you may as well book a Welcome Pickups transfer. As soon as you arrive at the airport you will be greeted by your driver. He will be waiting for you at the terminal of your arrival with a sign that has your name on it. Your driver will help you out with your luggage and together you will make your way to the vehicle. While he is driving you to your accommodation, the driver can give you some tips and recommendations on what to do during your holidays in New york. Our drivers are hand-picked and speak fluent English. No need to worry about miscommunication issues that you may face with the local taxi drivers regarding your destination. Relax and enjoy your ride. LaGuardia Airport taxis are the easiest option to get you into the city centre of New York with little hassle. They are often a good option for those travelling with lots of luggage, too, as they provide door-to-door service. Official yellow taxi stands are situated outside every terminal at LaGuardia Airport. There are also assistants available at every rank to assist you and guide you to a taxi. Most taxis are standard sedans, but there may be larger ones if you require, but be warned there can be a wait. Note that an extra USD$1 is charged between rush-hours of 16:00pm - 20:00pm. Taxis are the most comfortable option to get you to Midtown Manhattan. They reduce time walking, transferring and carrying around heavy luggage. Taxis in New York are overseen by law and there is many safety rights for those travelling in them, so you can be ensured that if you take an official taxi, you are in good hands. It is best not to take taxis during rush hours as traffic can be very bad which can end up costing a lot on metered fares. There can be a long wait at the ranks for the taxis at peak hours, as well as a slow transfer into the city and high fare. It is best to avoid taking taxis during these hours. If you have large luggage, you may be charged for it by the driver. Most taxis will accept payment by multiple means, but ensure you have smaller bills for tipping/payment or you might not get change. You are always expected to pay tolls along the route. How much is a taxi from LGA Airport to New York City Centre? A taxi between LGA and Midtown is metered, therefore you can expect to pay around for the trip. There is an extra charge for peak hour service, as well as tolls along the route. How many transfer options are there from LGA Airport to New York City Centre? There are two transfer options to get you into Midtown Manhattan, these are the train and taxi. Taxis are recommended as they are comfortable and faster for those with luggage, however the subway is great for those on a budget. How far is LGA Airport from New York City? La Guardia Airport is located 14.8km away from Midtown Manhattan. The journey by car in normal traffic should take on average around 30 minutes.